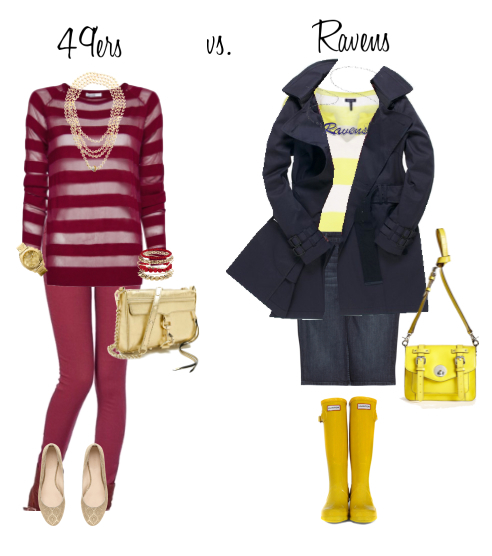 Super Bowl XLVII: Which will you wear? Er… root for? New Orleans will host this year’s Super Bowl. My family and I will spend our time watching at some friends’ house. And by “watching,” I mean “eating” our way through four quarters of football. I do love football, but I have to say I’m more excited about the party and wearing team colors! I was raised on the San Francisco 49’ers and my husband and I lived in the Bay Area for five years… so it’s only natural that we would be rooting for maroon and gold. On the flip side, I adore the Ravens colors and have far more in my wardrobe to cheer them on. Is that reason enough to change teams?